Our Daily Deal today is for anyone who likes to keep track of some things the old-fashioned - and often the more rewarding - way, off-line. 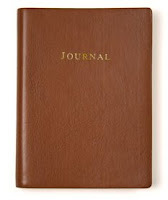 This lovely leather journal is handmade by one of Europe's oldest paper makers and features heavy Italian paper. A fantastic keepsake gift for any traveler, grandparent or new parent who might like to write down their thoughts, life story, or the adorable things the kids say/get up to. For today only we've reduced the price by 50%, and only while stocks last. Simply click below for more information and to purchase. This genuine leather journal with embossed gold motif is a timeless gift for anyone interested in keeping a record of their thoughts, memories, dreams, travels and more. Filled with 100 lined pages of acid free heavy Italian paper from one of Europe's oldest paper makers. Made by hand with skills learned from centuries of experience.